The trailhead site, found from a bathroom sign at San Diego Comic-Con. 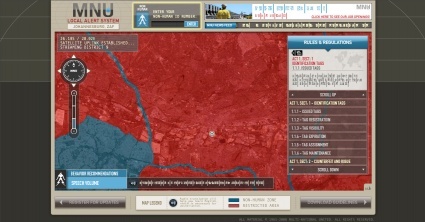 It displays a satellite view of 'District 9' and gives news updates, behavior recommendations, and a list of rules and regulations in both Human and Non-Human languages, depending on which option is chosen on the initial screen. When signed in as a Non-Human, speaker symbols can be clicked to hear a translation in English. Clicking on a marker within a red zone gives a warning about unauthorized access to restricted content. Doing so a second time boots the user to Multinationalunited.com. Links at the bottom allow the participant to register with MNU for updates or download a copy of the Guidelines. An entry box allows participants to enter a Human or Non-Human ID number. Location: North-west non-human zone, W. Hollis Rd. Following several anonymous tips, police raided a shack in region 15 of district 9, detaining two non-human suspects and confiscating several non-regulation electrical devices. Location: Mid-west human zone, Sand St. Sand Street is close while pipes are installed to increase utility distribution to human-only zones. Location: South-west human zone, Farris St. and Grey St. Authorities are quelling an unsanctioned protest near this non-human zone at the coner of Farris and Grey streets. Location: South-west human zone, 40th St. and Main St. Includes graffiti "MNUSPREADSLIES.COM"
Location: South-west human zone, "Everywhere"
A reminder, Any sightings of non-humans in public after curfews must be immediately reported to MNU authorities. 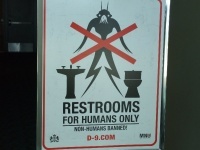 All non-humans are restricted to District 9 between 10 p.m. and 7 a.m. Location: South-west non-human zone, W. Franklin Ave. The 300 block of W. Franklin Ave. is closed for an ongoing investigation into a non-lethal shooting reported last night at 9:15 p.m. Location: South-west non-human zone, Empire Rd. and 19th St.
Police are investigating an incident involving non-human technology on 19th Street. Non-human injuries reported. No fatalities reported. A reminder: the deadline for non-human evacuation for the 300 blocks of Greenway and Steeplechase Roads is 11 a.m. tomorrow. Any non-humans still in this area will be detained. Location: North-central human zone, Elizabeth St. and Harbor Ave. Restricted access of area upon upon reports of a non-human nest in restricted zone. Authorities have detained three non-human violators. Access will be granted once eggs are destroyed and the surrounding areas are sterilized/sanitized by a hazardous materials crew. Location: North-central human zone, 200 block of W. 17th St. Location: South-central human zone, City Hall, 12500 Main Street. A meeting at City Hall will be help to discuss a series of new ordinances proposed to help address the recent outbreak of non-human trespassing. Location: South-central human zone, 200 block of Sagamont. MNU began the evacuation of several businesses and the court house on the 200 block of Sagamont after receiving what they determined to be a non-human terrorist threat by phone. The evacuation is in effect until tomorrow. Location: South-central human zone, Bay St.
Bay Street will be closed until further notice as MNU works to complete construction of its new recruitment facility. Location: Southern roadway (blue zone), Sagamont St. between Clark and Raleigh streets. Motor vehicle collision involving injuries on Sagamont street. One east-bound lane is closed until further notice. Location: South-east human zone, Avondale Rd. and Olive St.
22 non-humans were detained on charges of inciting a riot when they refused to show their MNU-issued ID tags. Location: South-east non-human zone, 700 block of S. Freeport Rd. Police detained one non-human on charges of intoxication after seeing it stumble down South Freeport Road. Location: South-east non-human zone, Bay St. and Crabtree Rd. MNU security forces have contained a group of non-humans suspected of rioting near the corner of Bay and Green Street. 40 non-humans are in custody. Location: South-east human zone, east of the blue-zone roadway, 400 Block of Birch. A non-weapon assualt on an MNU officer by a non-human resulted in an arrest. MNU backup forces were called to quell further violence. Location: Mid-east Human zone, Highway J. Reminder: Nonhuman buses are scheduled to be on the highway from 6 to 7 a.m. and 9 to 10 p.m. Citizens are advised to avoid this highway at time of transport to ensure ease of traffic and passenger safety. Location: Mid-east human zone, Harris St. and 41st St.
Officials are looking for a 12-year-old human girl Emily Trenton, who has been missing for more than 48 hours. MNU Officers are looking for a large non-human suspect in a blue shirt. Please call your nearest MNU station if you’ve seen Emily or have any information about the suspect. Location: East Roadway (blue zone), Bates Rd. Bates Road is closed between Ashland and Smith streets. No injuries were reported, but the explosions destroyed three cars and knocked out several nearby apartment windows. Four non-humans from the site have been moved to an MNU station for questioning. Location: North-east non-human zone, 1500 block of N. Rosemont. Includes graffiti "MNUSPREADSLIES.COM". Convenience store closed during MNU investigation of a robbery. No injuries reported. Location: North-east non-human zone, Rosemary St. and London St. Includes graffiti "MNUSPREADSLIES.COM"
Investigators uncovered an abandoned drug warehouse at the corner of Rosemary and London and have issued the descriptions of four non-humans they say may have been involved. Refrain from the manufacture and distribution of items that may glorify non-human culture. Please avoid giving money to non-human beggers. Drawing pictures and using simple sign language can be an effective way to communicate with non-humans. Simple hand gestures may be misunderstood by non-humans. Use with caution. Entering District 9 without a MNU chaperone is discouraged. Please refrain from using non-human drinking fountains to prevent the spread of disease. Report all suspicious non-human behavior to a MNU officer immediately. Learning the non-humans' language can be a valuable job skill. Non-human eggs are private property. Please avoid contact. Speaking clearly and loudly to a non-human will help it learn English more quickly. This is an MNU behavior reminder. MNU agents are stationed for your safety and protection. This is an MNU behavior reminder. Duck when entering human establishments to avoid head trauma and prevent property damage to human buildings. This is an MNU behavior reminder. Always speak in soft tones when addressing humans to avoid confrontation. This is an MNU behavior reminder. Non-human chants and music must only be performed indoors and within the confines of District 9. This is an MNU behavior reminder. Never eat human pets. This is an MNU behavior reminder. Refrain from excessive use of tendrils in public restaurants. This is an MNU behavior reminder. Always speak English in public. Spoken English is required for inter-species assimilation. This is an MNU behavior reminder. Please keep creative expression private. Art, photography and other crafts found in public will be destroyed. This is an MNU behavior reminder. Please bathe in your designated MNU housing facility. This is an MNU behavior reminder. Always offer your seat to a standing human on a public bus or train. This is an MNU behavior reminder. Please refrain from direct eye contact with humans. This is an MNU behavior reminder. Always avoid physical contact with humans. This is an MNU behavior reminder. Please refrain from bathing in human swimming holes or beaches. This is an MNU behavior reminder. Offspring and eggs are not be left unsupervised at any time. This is an MNU behavior reminder. Never disrespect an MNU officer. This is an MNU behavior reminder. Always allow humans the right of way on public sidewalks. This page was last modified 14:49, 2 August 2008. This page has been accessed 85,341 times.